I'm not usually the luckiest guy around. I have never planned on any luck making a difference in any area of my life. Hard work and determination has been good though. March of this year, 2015, a fellow from the Dallas club called. Lets call him John. Asked me if I was going to the HOT event in Burnett in April. I told him yes. Said he had bought a pair of modified heads and wanted me to look at them at the event. Said he thought they might be a pair modified in the 60's by Bill Thomas. We met up and examined the heads. They sure looked interesting. An extra carb mounting pad, rotated, angle port exhaust and BIG valves. Gees, these heads still have the small EM cylinder openings. And the chambers are very clean. Look very much like 140 chambers. John had someone in Dallas weld up the spark plug holes. Said they were bad. John then said he would like me to take them with and freshen them up so he can install and run them. Wow, I am honored! Once I got them to the shop I spent a couple of hours looking, measuring, checking. The workmanship is top notch! Actually flawless. Maybe these are Bill Thomas heads. John had found some PDF files online and emailed them to me. One was an original Bill Thomas catalog. And right there were these heads. The Competition version no less! An extra carb mounting pad welded onto the intake log and rotated 90 degrees. These heads are really cool. I need to try to determine how much material has been removed from the fins. This will help me figure out the depth cut on the headgasket surface. I'll need to do a very light clean up cut on the gasket surface before I let these go home. I have already cut new spark plug holes. Turned out fine. The only issue was the welder left a little tungsten present in one of the holes which I found when I was milling the holes. Dinged up the end mill a little. The 2nd picture shows the larger intake guide. The same sized guide is used on the exhaust. Very interesting that these valve sizes can be used on an early model chamber diameter. Of course this is due to altered guide angles. And 3rd is the valves. Very close to the stock 140 intake and exhaust sizes. Carb rotator welded to the intake log. 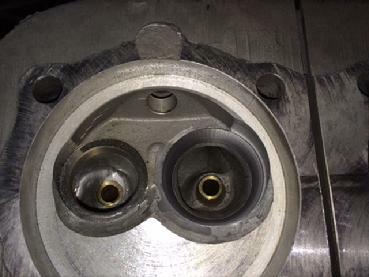 The increase in height is to allow a carb rotator to be bolted to the original carb pad so the primary carb can be turned 90 degrees to match the added carb. The CTC spacing is a little closer than on the 140 heads. Angle ports are 1 3/8" OD and did not come with flanges. I'm not yet sure how Bill wanted the headers attached. I'm still researching this feature. The owner wants me to add flanges. I will be glass beading the heads to get them cleaned up. I think the black paint will help with cooling but the owner wants this off. The guides have little to no wear. Same with the valve stems. Here are the heads back from the local machine shop. I worked on one head bead blasting it but after 45 minutes it still looked crappy. So the local shop blasted both and now they look wonderful. The chambers are extremely well finished, shaped and smoothed. Bill Thomas Race shop did fabulous work. But... they incorporated some old school hotrod ideas that today we know don't work. The short side radius has been cut away which straightens the port. But this kills flow. Also there are some abrupt angles added to the intake seats during the valve job. This too will hurt flow. All in all though they are a treat to work on. These heads had a profound influence on the development of the Corvair engine. If Bill Thomas had not developed and built these we might not have the much loved 4 carb 140 engine. It was because of the Thomas heads that Chevy came out with their version of big valve heads. I'm not sure if Bill Thomas benefited financially from this or not. I hope he did. The 1963(my guess) Bill Thomas brochure shows these heads. They are the C11 Competition units. And they are priced at... ready for this? A whopping $314 each, exchange. Sounds like chump change. Until you figure in inflation from that time period. My Dad was paying $125 a month on his mortgage for his first new house. So about 2 1/2 times his payment. Per head! So lets see, 5 months worth of house payments for a pair. In today's money that looks like 6250.00! That's at a house payment of $1250.00. Kinda normal here in San Antonio. My ulterior plan for these heads is to copy the guide angles and build a pair of machining fixtures which will allow me to machine both small valve heads and 140 heads for the altered guide angles. I'm thinking on the 140 heads a larger intake valve can be easily fitted. I'm not sure if I need to change the exhaust valve diameter. Some of you guys might want this. If so, let me know. I have already lined up the guides and will be working on prototype heads to validate the new angles. So hopefully I'll have Bill Thomas inspired heads available for purchase. Wish me luck. I might need some. Here I have one of the Thomas C11 heads on my roll over fixture. I use this to set the guide to vertical so I can determine the guide angle Bill used. Off this fixture I will make the first head mounting plate used for guide bore milling. I'll make a second plate for seat register machining. So I have this junk turbo head I was working on. Found a crack running through the seat register cut once I began the big valve machining. Can't trust that the exhaust seat will stay in. So I fit this on the seat fixture and cut the intake guide bore to the angle Bill Thomas used. I made an aluminum test guide to hold the valve in position. The 140 intake fits fine. And the CTC at the valve stem tips is the same as a stock head. So the rocker arms will open the valve correctly. Nice. Now onto a pair of heads to build and test. Here is a very clean 66 110 head. I've already welded up the quench and flycut to final position. New guides installed. The registers for the intake seats are cut. Exhaust are next. Then onto seat installation. I'm not sure if I will cut off the intake log top and replace it with a 140 top. I'll make that decision once I check this head on the flow bench. I installed the seats. Valve job is yet to come. I cut the excess weld back at the edge on the quench. And I opened up the ports on the left chamber. Just to see how they will look. I will keep the extra material that extends from the quench between the seats. The matching head is going to the local machine shop for vat cleaning and glass beading. Next is the latest picture. I cut the intake seats with my Goodson profile cutter. Made a very nice radiused seat profile. These will flow more than the original Thomas C11 heads. And I'm thinking will better a 140 head. The seat ID blended to the port exceptionally well. The weekend before Christmas My buddy Mike and I spend all of Saturday and Sunday morning swapping the heads on a 1965 4 door Monza. It is a 110 with a powerglide. 83,000 original miles. 9 months prior it had dropped an intake seat on #3 cylinder and was parked. I was fortunate enough to have met the owner Garey at a Corvair BBQ gathering last fall. He expressed his desire to start driving his car again and we discussed some head work. He decided to go with a pair of my big valve heads. I had taken one of my latest, my Bill Thomas Tribute heads for show and tell. Garey opted for a pair of these. I built him a pair using 65 110 heads. Did all my usual updates that come with my regular big valve heads. The head swap went with only a minor hitch... the upper right head stud on #5 cylinder had backed out when we were removing the head nuts. Threads on both the stud and in the case were fine. So I cleaned both, added some green Locktite and threaded the stud back in to the correct depth. Torquing the head studs went fine. At 11:30 we fired the engine which, by the way started in 1/2 a revolution. Checked for leaks, found none. Then took off for a road test. Man, does this thing fly! The throttle is very linear, pulls hard right from a standing start. The PG stays in 1st gear much longer than before which makes drivability much better. Both Mike and I had smiles all the way. Of course Garey loves the way his car drives. So much so that he had me install a set of Bilstein shocks on all 4 corners. He has a very, very nice 65.